Below are common attributes associated to Isaai Hardy Kiwi. Become a care taker for Isaai Hardy Kiwi! Below are member comments regarding how to plant Isaai Hardy Kiwi. No comments have been posted regarding how to plant Isaai Hardy Kiwi. Be the first! Do you know how to plant Isaai Hardy Kiwi? Below are member comments regarding how to prune Isaai Hardy Kiwi. No comments have been posted regarding how to prune Isaai Hardy Kiwi. Be the first! Do you know how to prune Isaai Hardy Kiwi? Below are member comments regarding how to fertilize Isaai Hardy Kiwi. No comments have been posted regarding how to fertilize Isaai Hardy Kiwi. Be the first! Do you know how to fertlize and water Isaai Hardy Kiwi? Below are member comments regarding how to deal with Isaai Hardy Kiwi's pests and problems. No comments have been posted regarding how to deal with Isaai Hardy Kiwi's pests and problems. Be the first! Do you know how to deal with pests and problems with Isaai Hardy Kiwi? Looking for Isaai Hardy Kiwi? Hardy kiwi often do not survive the first growing season. This is generally due to planting in a poorly drained soil and the development of root rot or neglect after transplanting. So, make sure you plant Hardy Kiwi in well-drained soil and full to mostly sun. 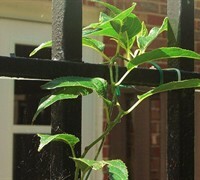 You'll also need to provide a trellis or some sort of support for the vine to cling to and climb. Hardy kiwis must have strong vertical support. In their native forests, these heavy vines climb trees. In a home garden, they require a sturdy structure such as a patio overhead or a trellis with 4-by-4 supports. If you prefer to plant bare-root, buy and plant hardy kiwis in winter or early spring, when you would any other bare-root fruit. In cold-winter areas, plant after all chances of frost have passed, from spring until midsummer. In areas with long growing seasons, plant hardy kiwis anytime, but do avoid the hottest parts of summer, when transplant stress is high. When planting, do not bury the plant or it's rootball too deep in the soil. If container-grown, make sure to plant it with the top edge of the rootball even or level with the ground. Dig the planting hole at least 2 feet wide. Then add and thoroughly mix in organic matter in with the soil removed from the planting hole, such as mushroom compost, at a 50/50 ratio to heavy clay soil and a 25/75 ratio to loose, fertile soils. When backfilling, tamp as you go to remove air pockets. After planting, water deeply. From that point forward and until the plant has become established, water enough to keep soil damp but not consistently wet or soggy. Mulching around the plant with an inch or so layer of shredded wood mulch or pine straw will help retain moisture so you won't have to water as much. Less pruning required on the Issai Hardy Kiwi because of its early fruiting and spur type growth. It may not require any pruning in it's first year or two. When you start to prune, do so in late winter while the plant is still dormant without leaves. Cut only to guide the plant to the form you want it to take. I would suggest allowing only 1 or two shoots/stems to grow up the trellis, fence or other support structure. These shoots/stems will become the trunks of your vine. When the shoot(s) have reached the top of the support structure you can nip the top off just above a bud. Also remove any side shoots growing from the main stem/trunk. New stems will emerge from beneath your top cut and these can be trained to grow horizontally along the trellis, the top of a fence, or over an arbor. In future years you can prune the horizontal branches to control the length of the vine. Always cut just beyond a bud to avoid leaving a long section of dead stem, which will attract disease. When fertilizing a plant that produces fruit you will eat, I always recommend the use of an organic plant food and/or mulching with organic compost. Feed the Kiwi vine in spring, after all chances of frost have passed. When established, Kiwi vines are tough plants. The main problem in growing them is overwatering. Consistently wet or soggy soil is a killer and this is the reason most newly planted vines do not survive the first year.